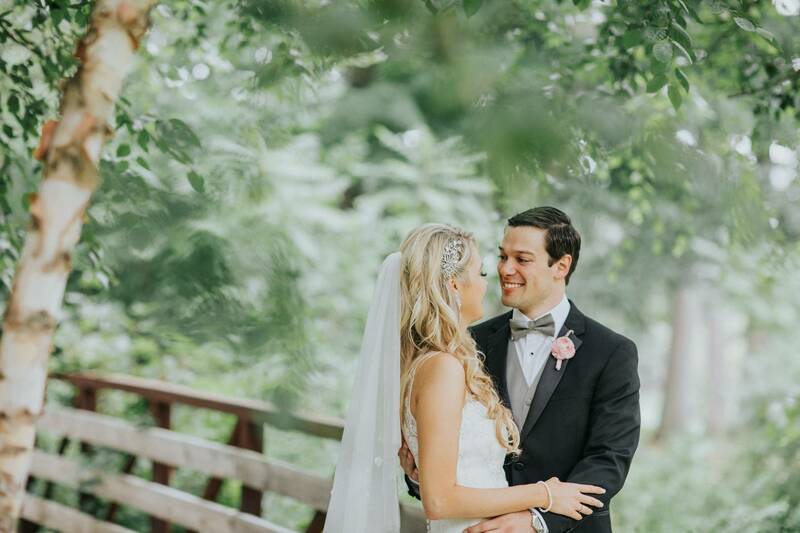 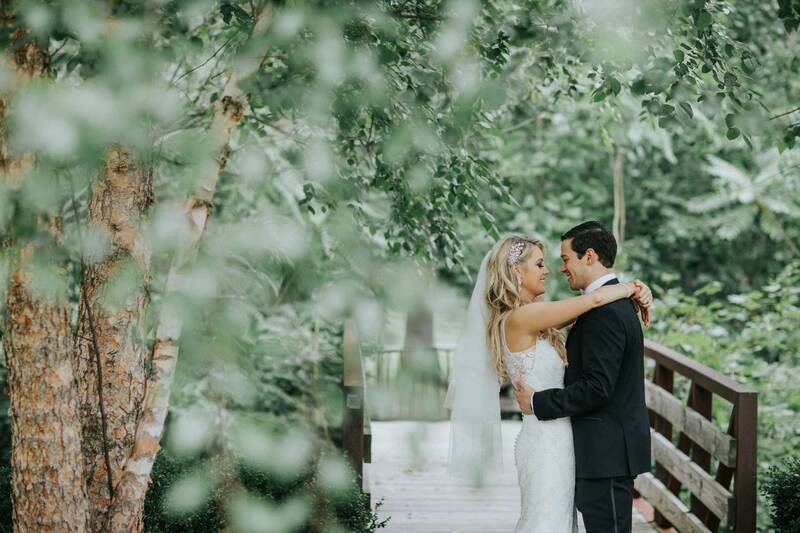 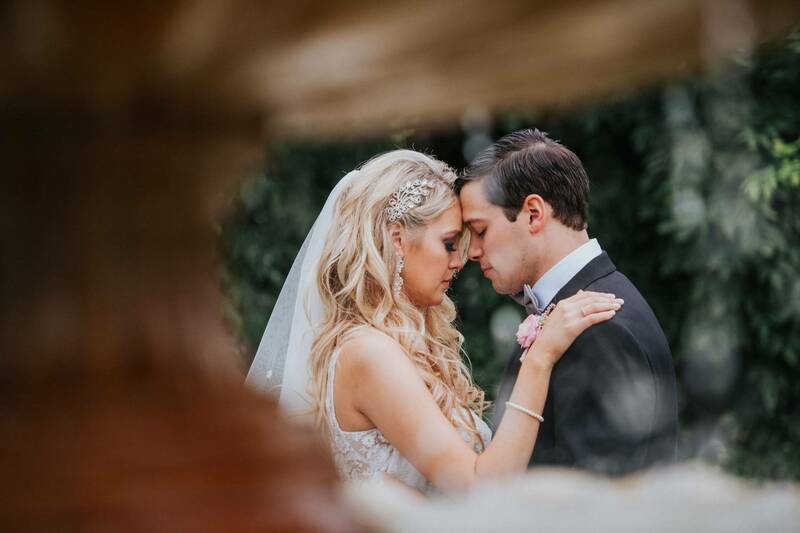 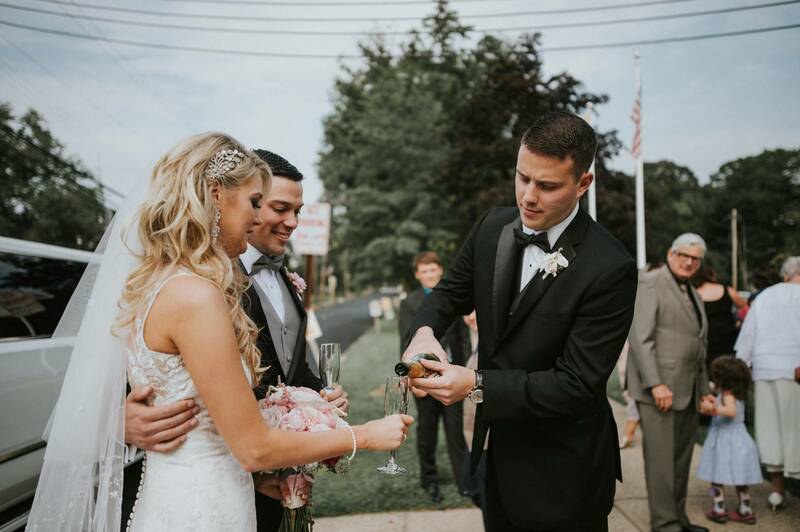 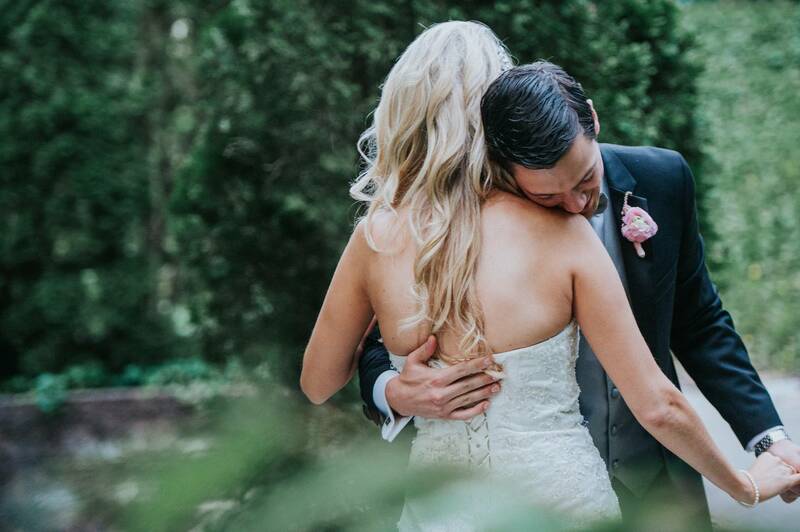 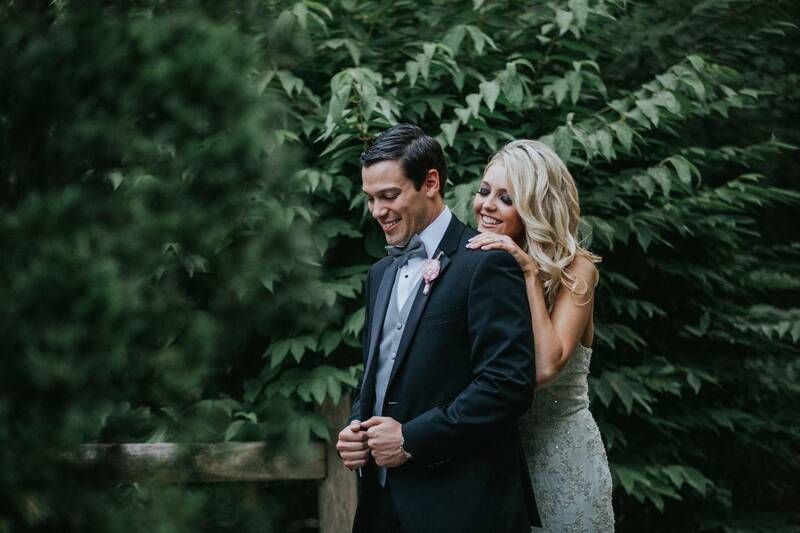 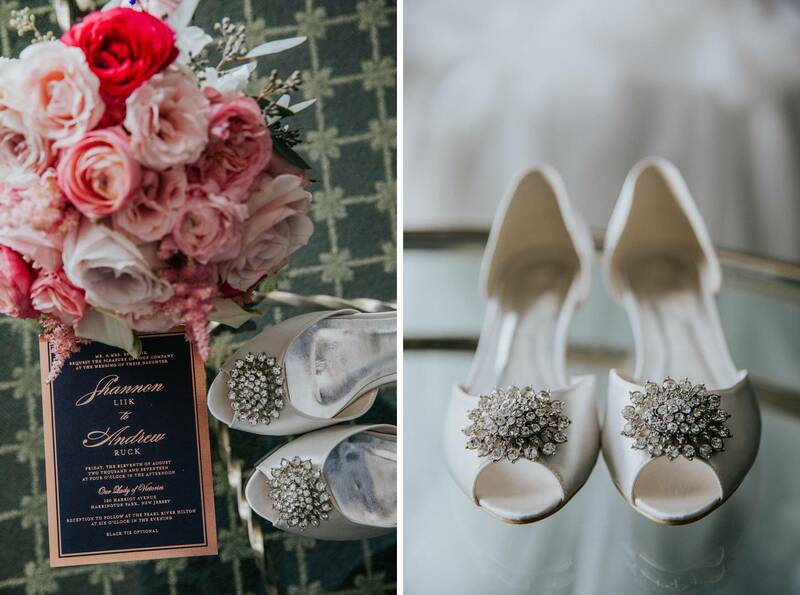 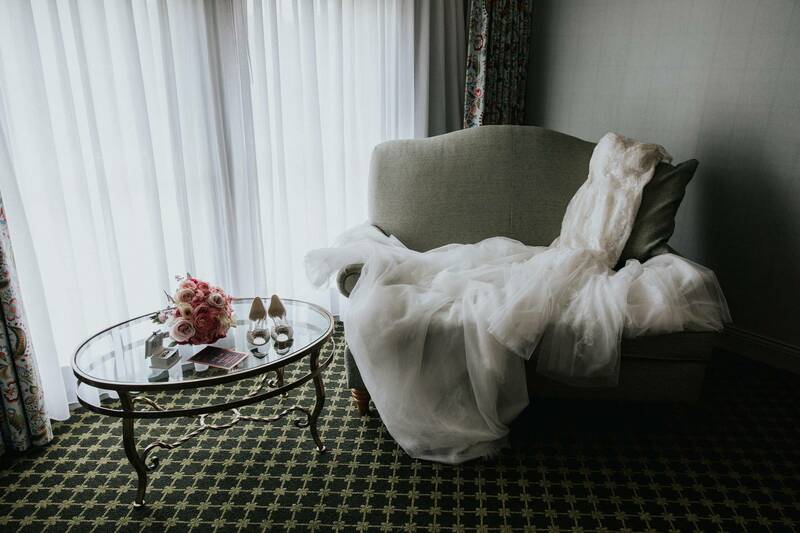 On this gorgeous wedding day, we met Andrew and Shannon the Hilton Pearl River set within the small town of Pearl River sitting on the northern border of New Jersey and New York. 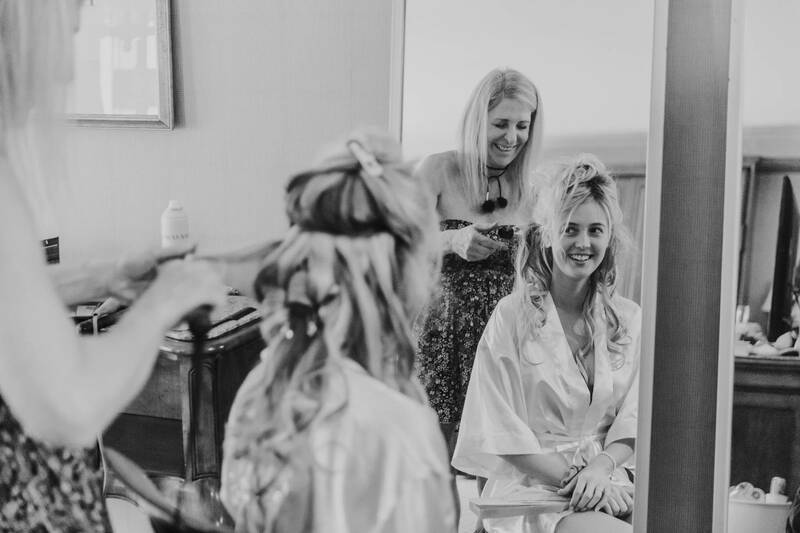 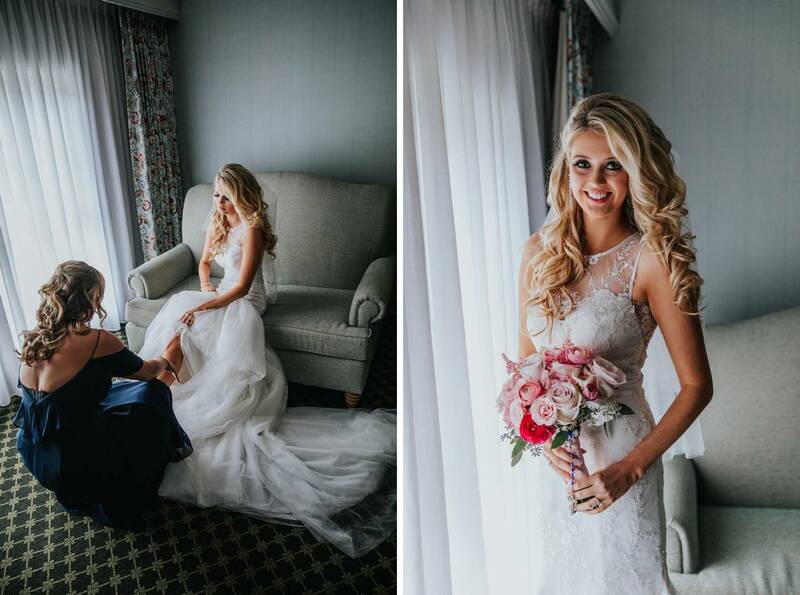 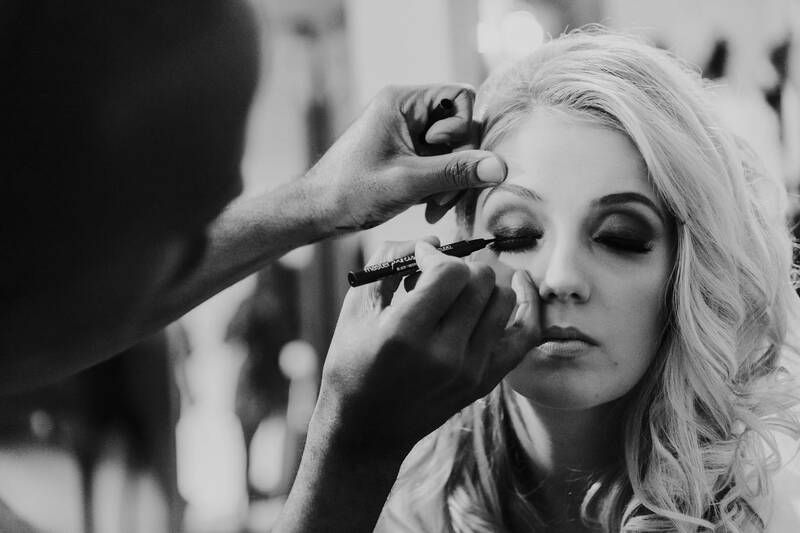 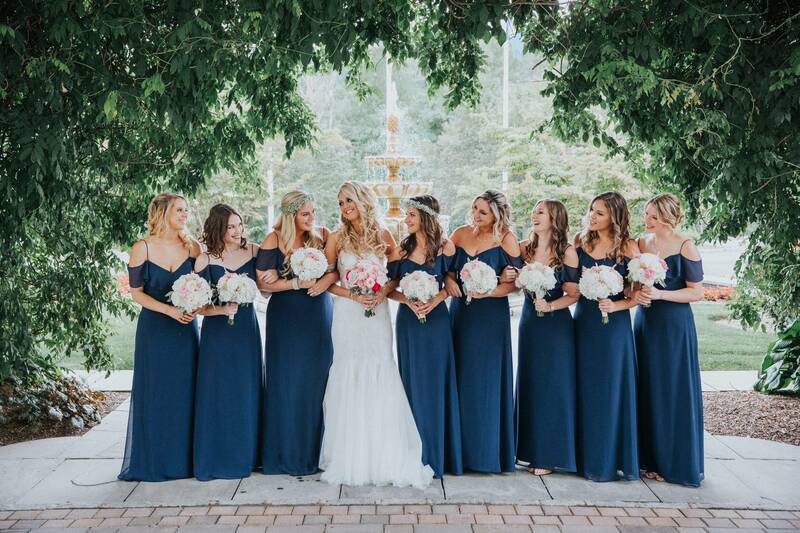 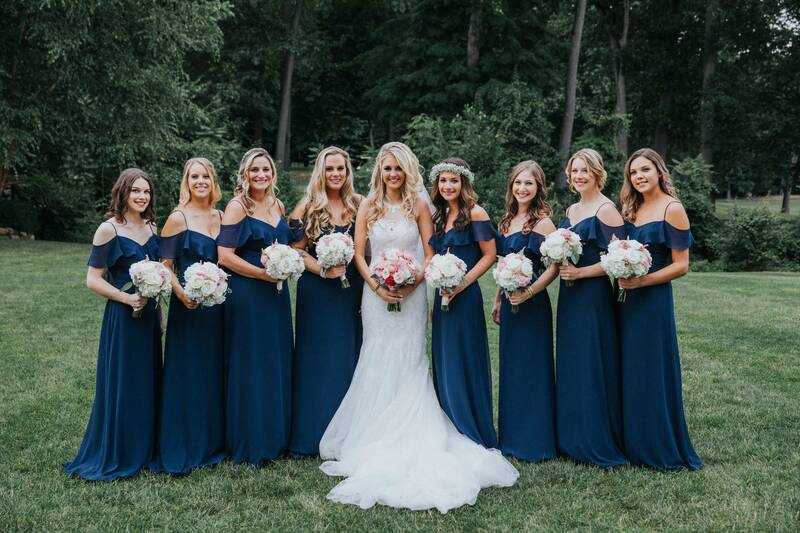 When we arrived that morning to begin the photography, Shannon and the bridesmaids were in the midst of perfecting their hair and makeup while the groomsmen enjoyed subs downstairs. 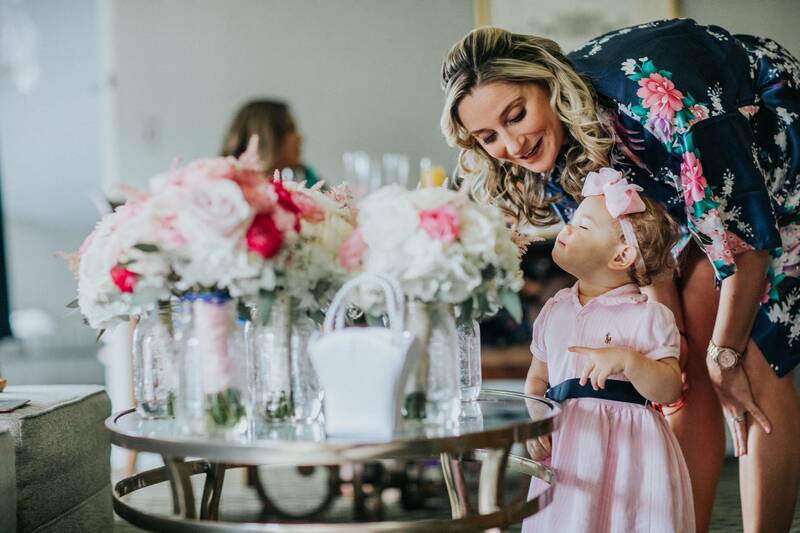 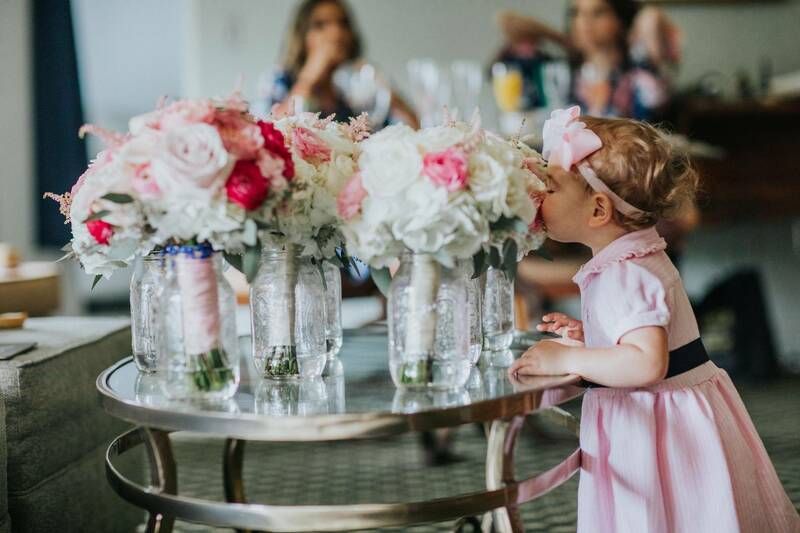 The adorable flower girl stopped by the brides room to quite literally smell all of the flowers while the bridesmaids watched the groomsmen taking photos from the top floor windows. 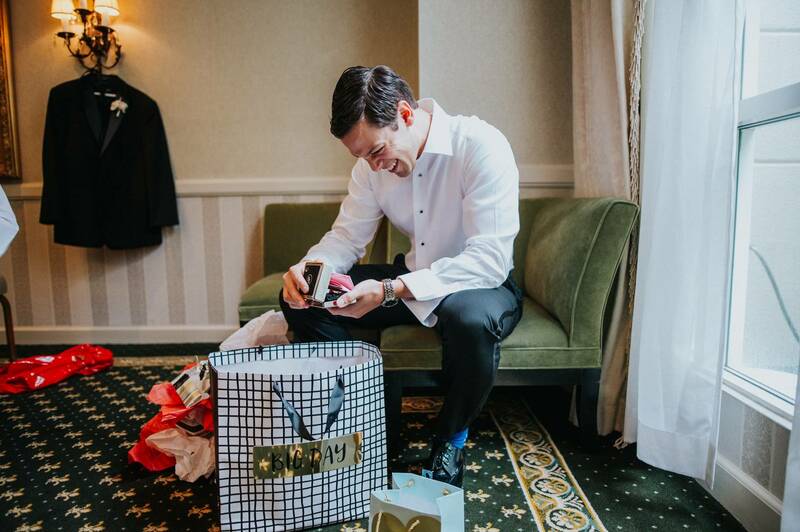 Natural sunlight streamed into the room as Shannon sat and read the final of several handwritten notes left by Andrew and opened the present from him. 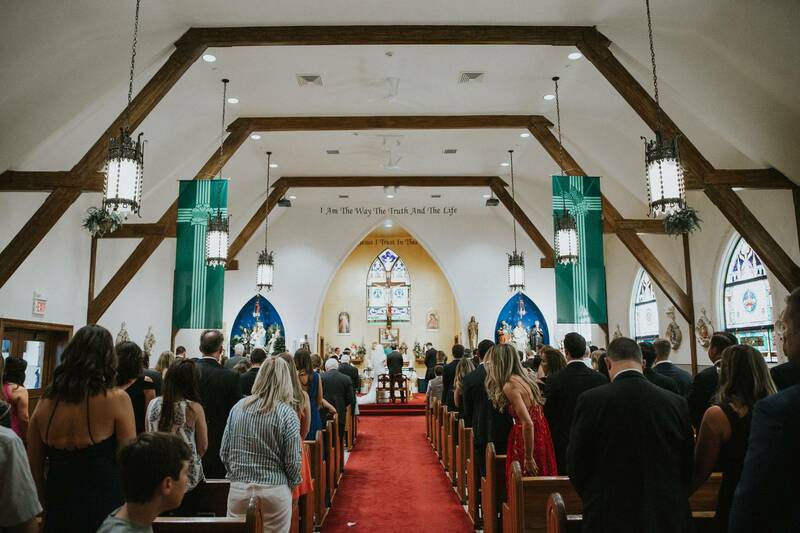 Then, her mother and sister helped to button the elegant dress and soon everyone were on their way to the fast approaching ceremony taking place at Our Lady of Victories church in nearby Harrington Park, NJ. 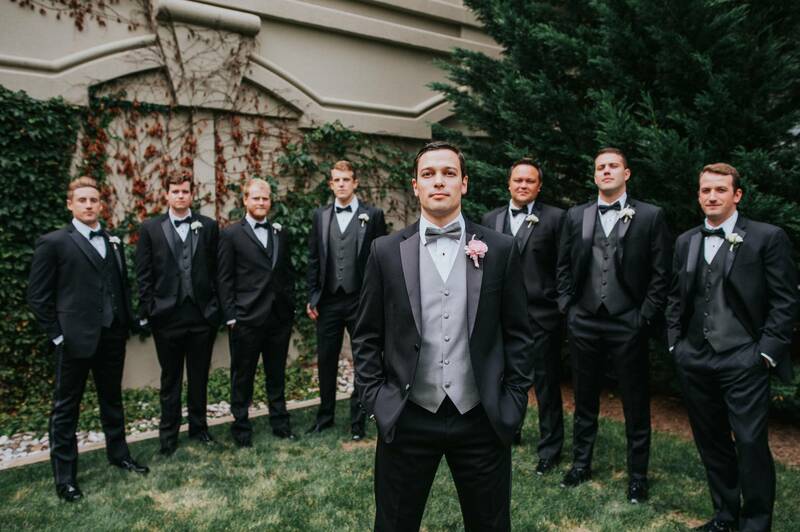 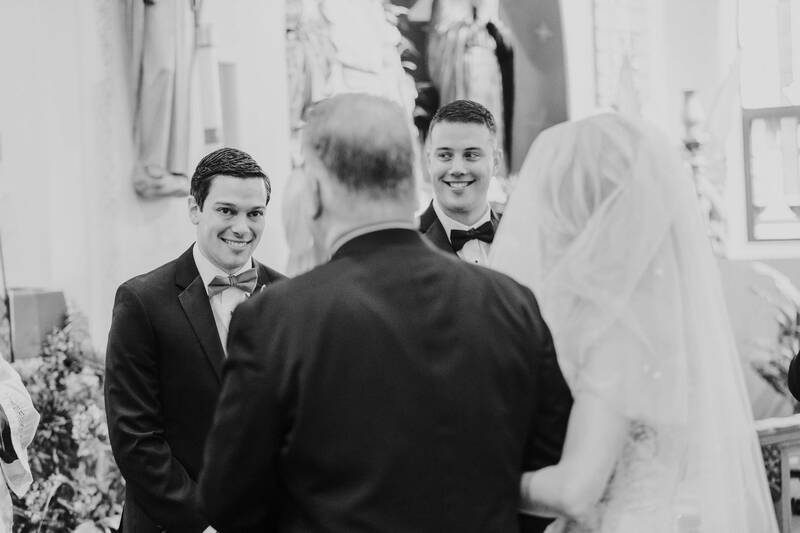 As guests were seat and the bridesmaids and groomsmen walked up the aisle of the church, you could see the anticipation in Andrew’s eyes. 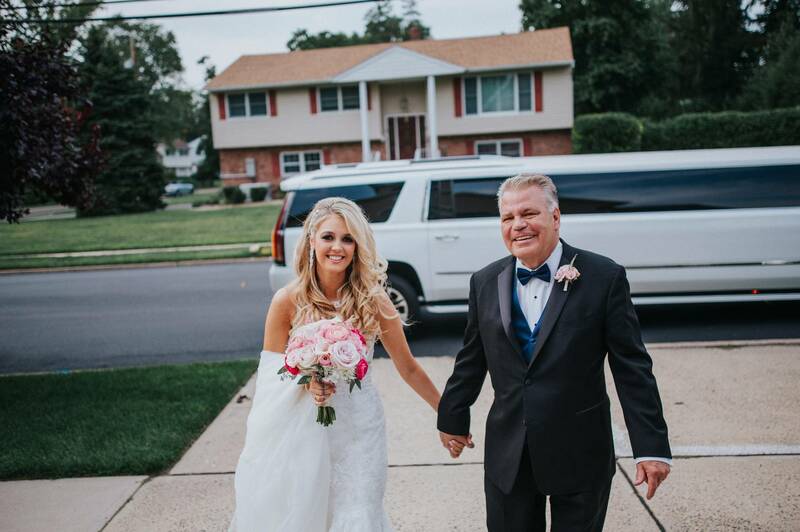 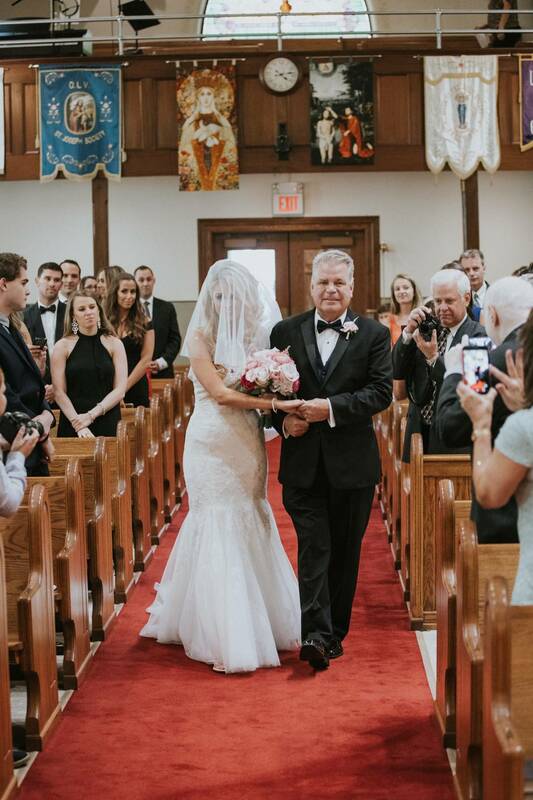 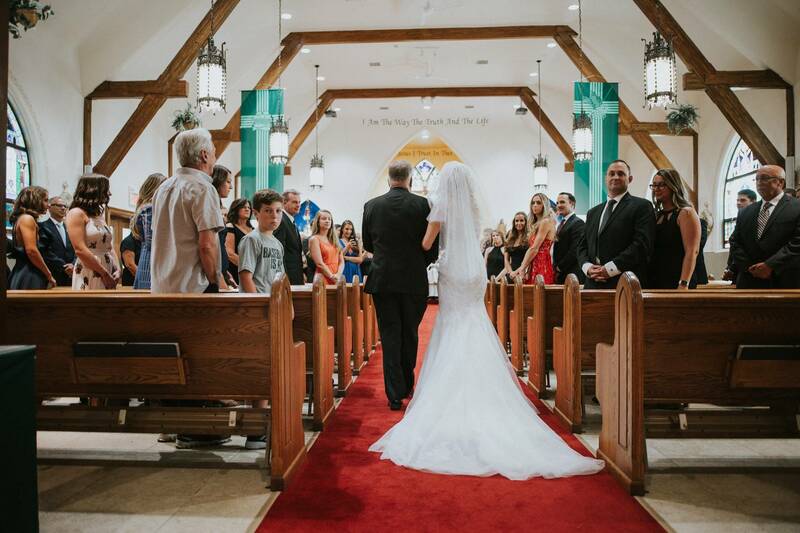 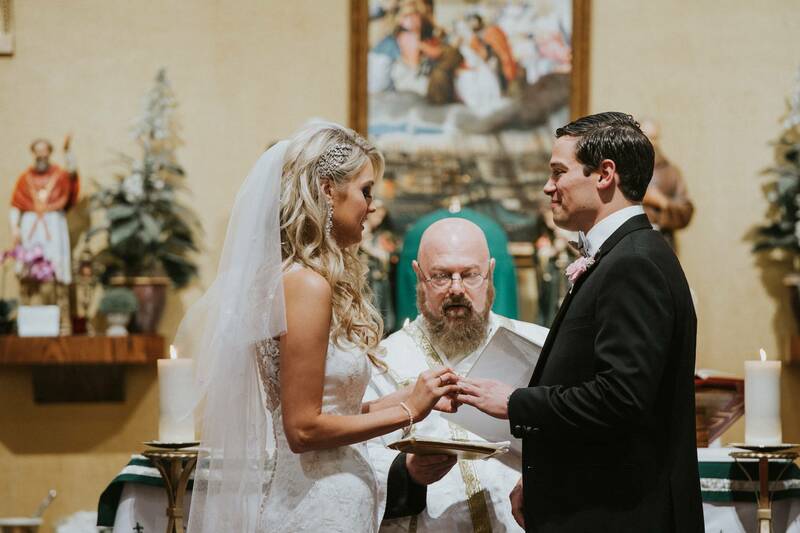 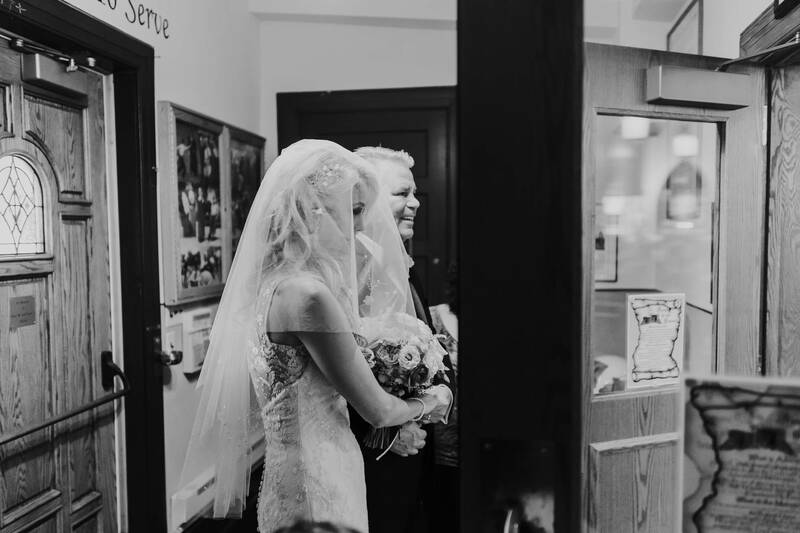 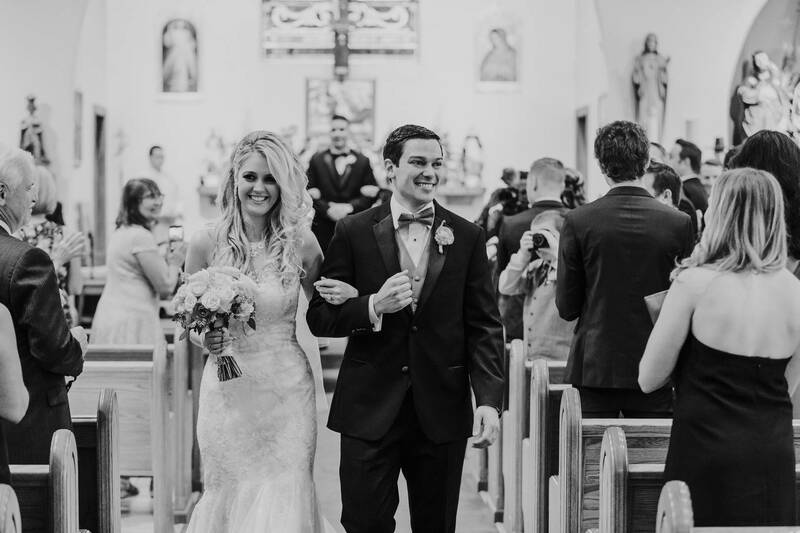 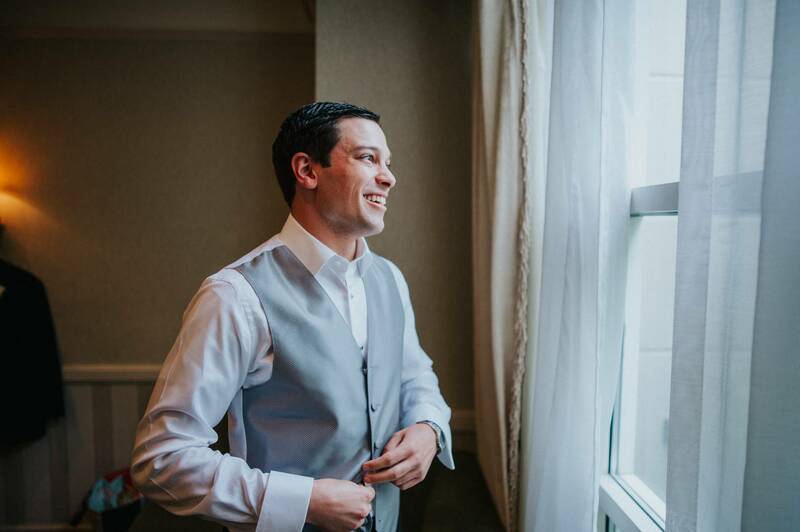 When doors opened and Shannon made her way to the alter accompanied by her father, Andrew could hardly contain his joy with a wide smile. 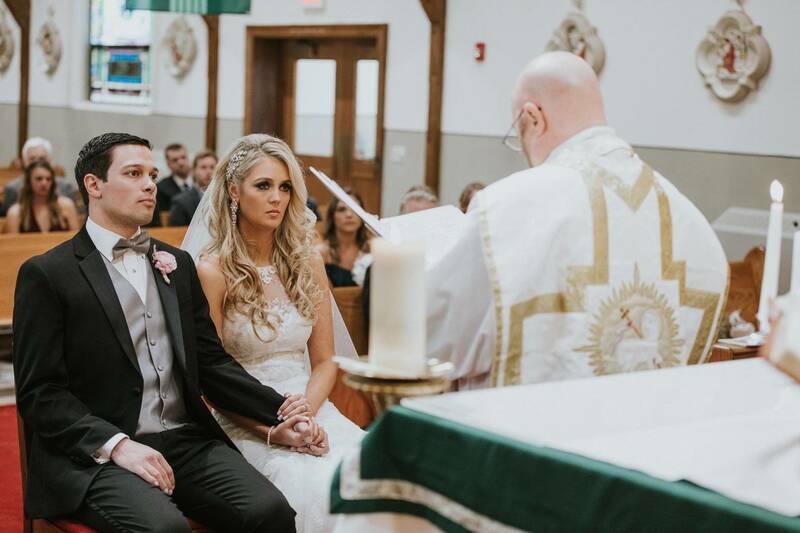 A touching ceremony followed with readings and advice given by priest and family with full a mass. 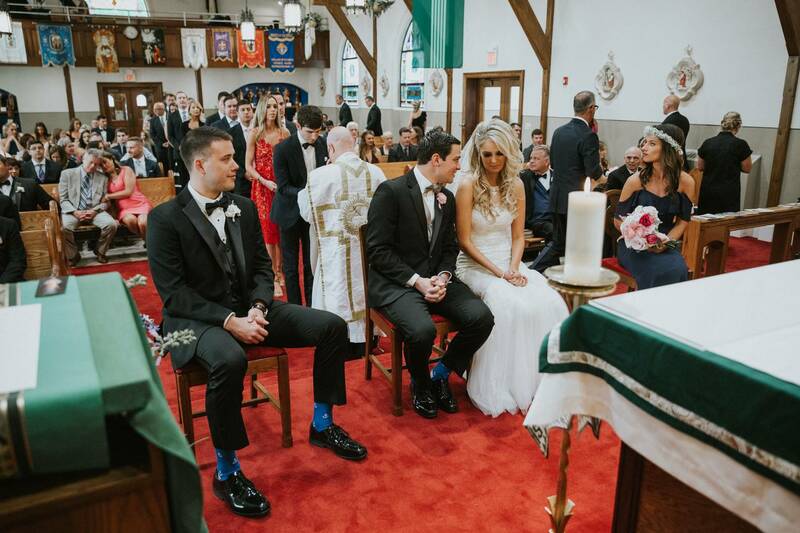 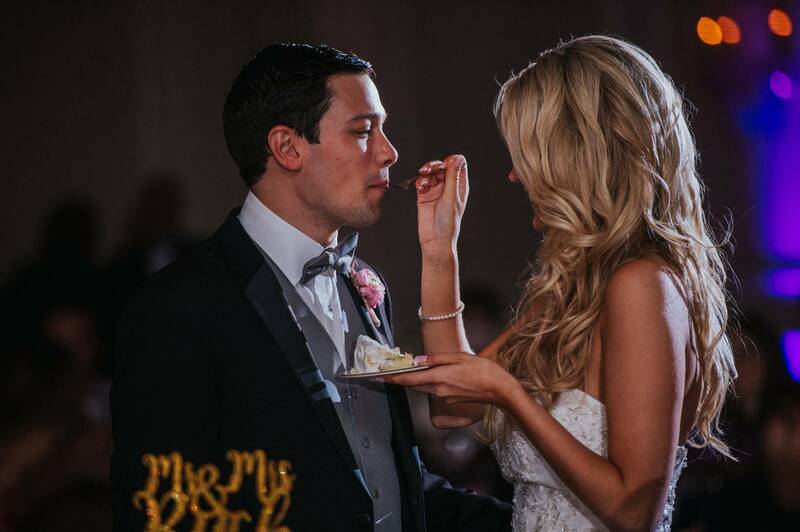 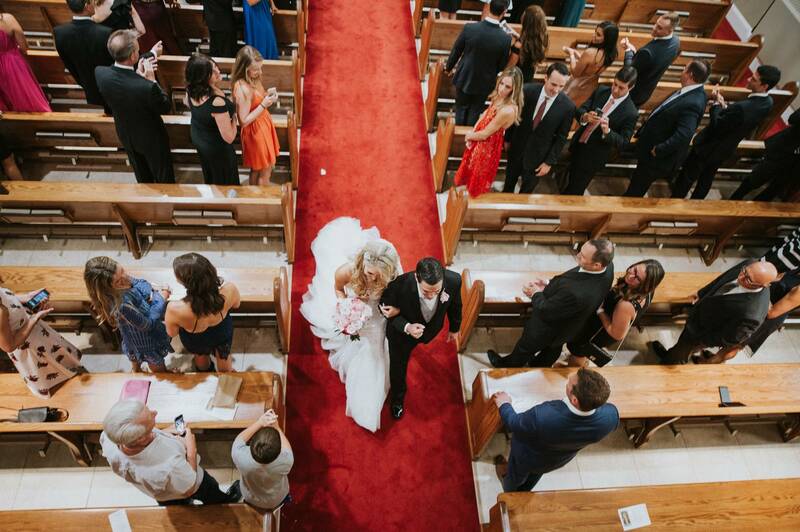 The pair the exchanged rings and were officially married with a kiss as cheers erupted from the guests in the pews. 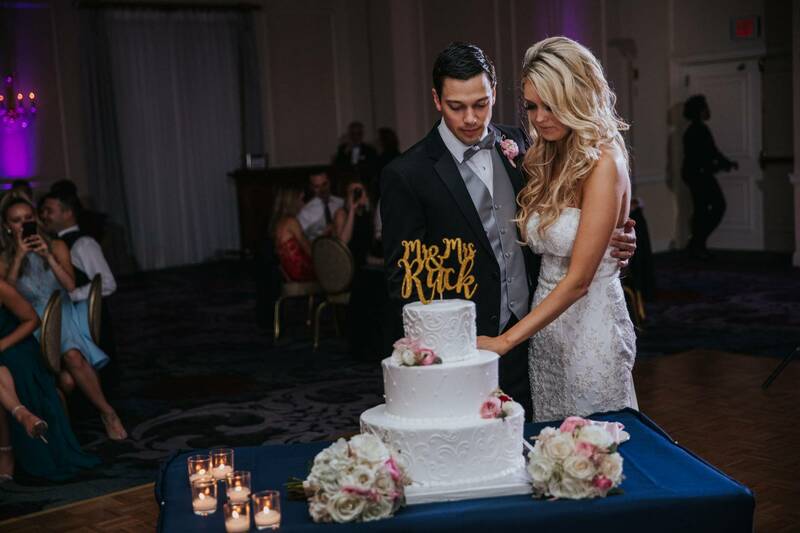 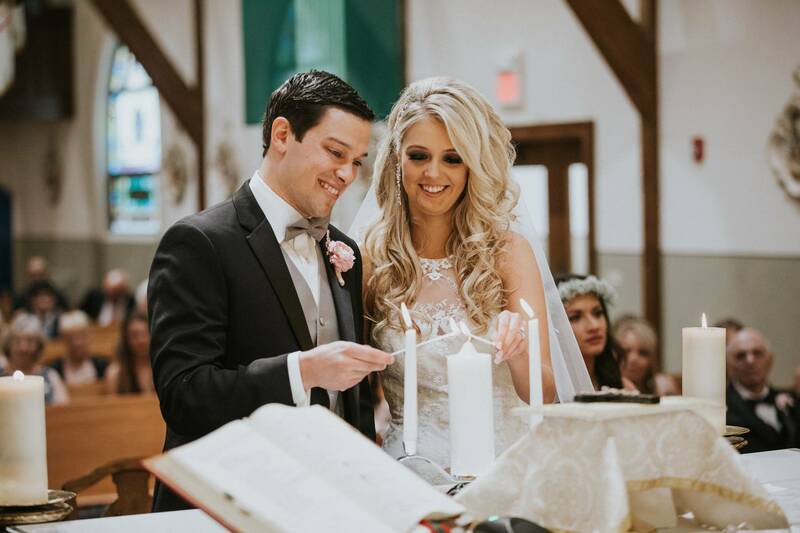 The couple shared a glass of champagne on the church steps and took the limo back to the Pearl River Hilton for their reception. 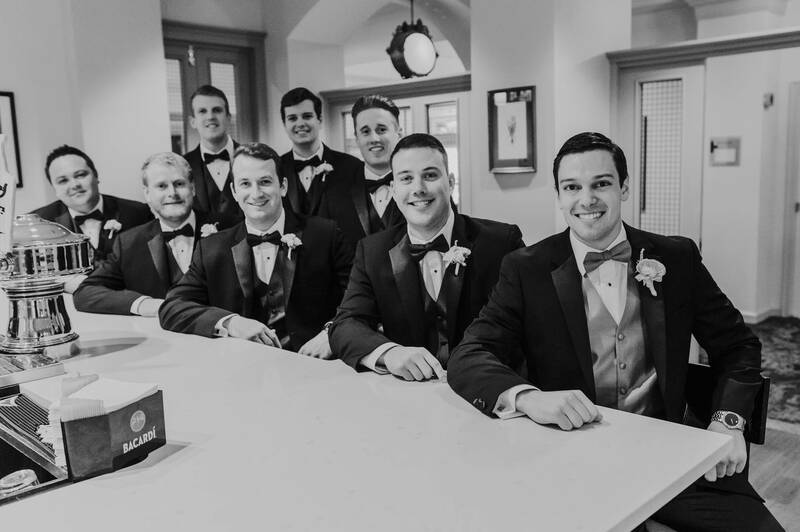 During cocktail hour, we captured many combinations of family members and then explored the beautiful grounds of the hotel. 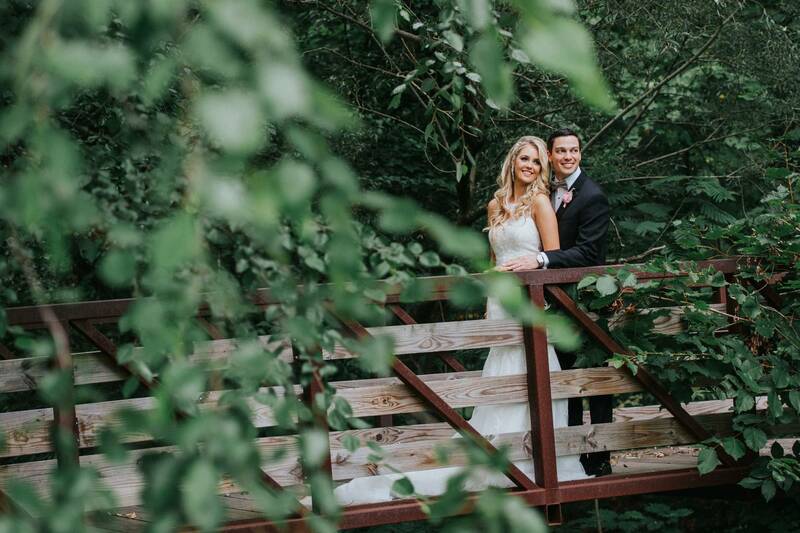 We discovered numerous picturesque spots that allowed us to create beautiful and unique portraits of the bride and groom and capture their love for each other. 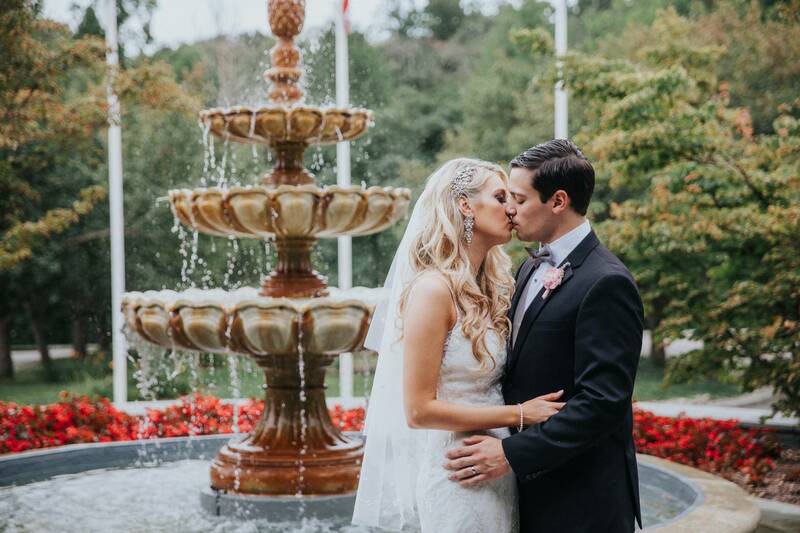 The photos on wooden bridge with trees draping over and through the water falling down elegant fountain were among our this wedding day. 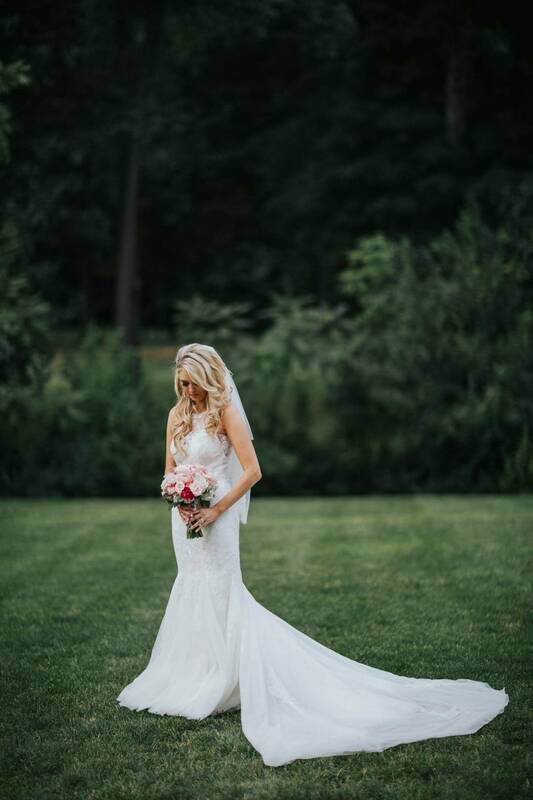 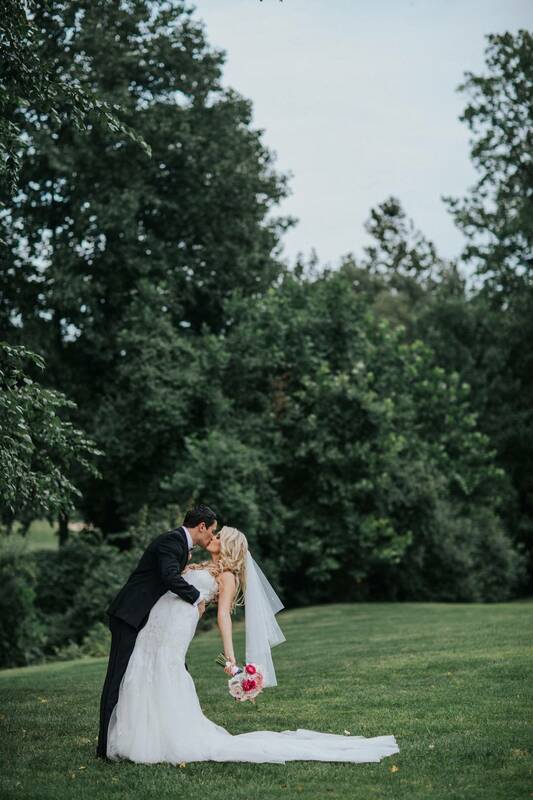 After Shannon changed into a second reception dress, we captured a quick a “first look” between the pair on one of the landscaped paths as the sun set. 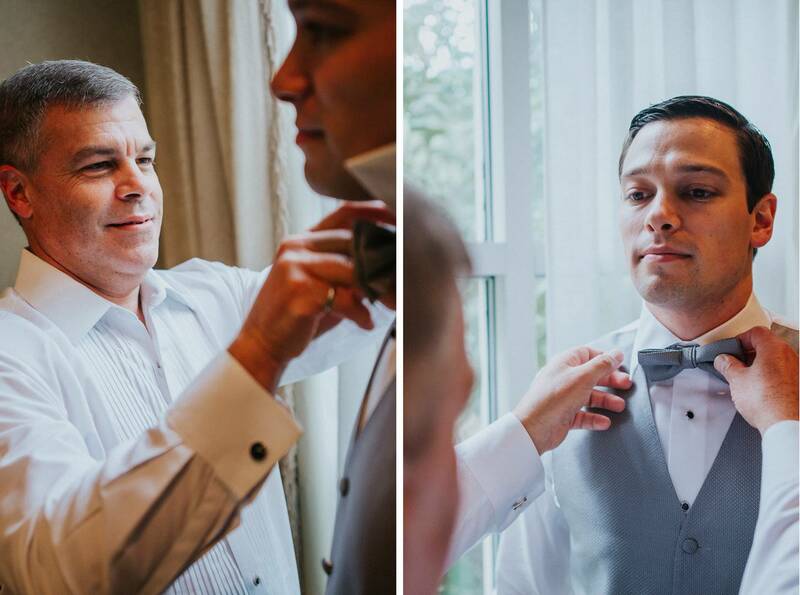 It was amazing that even after the ceremony and portraits, it was still an emotional moment. 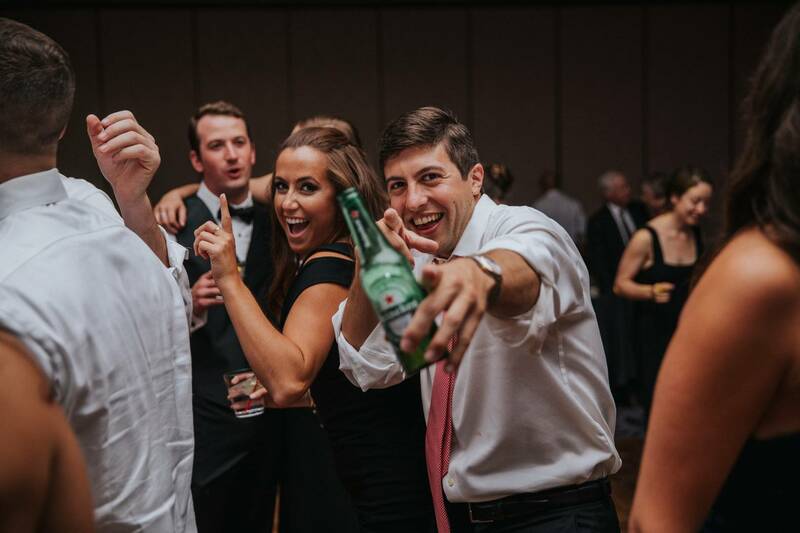 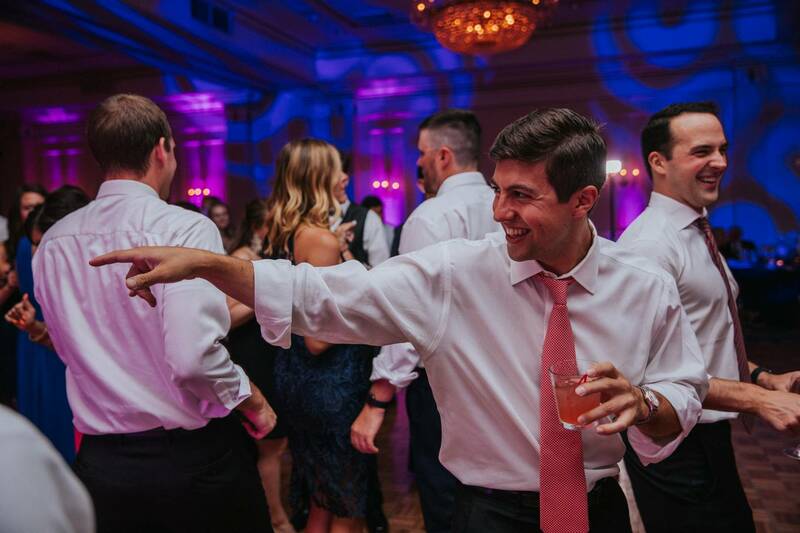 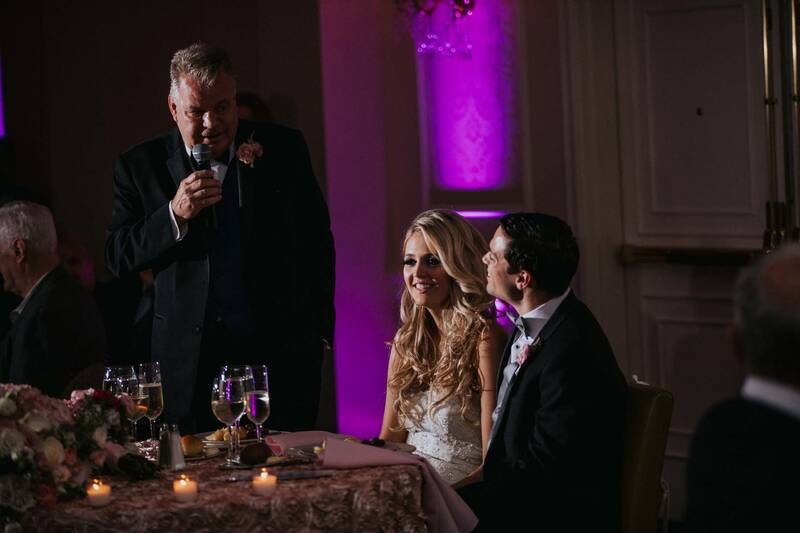 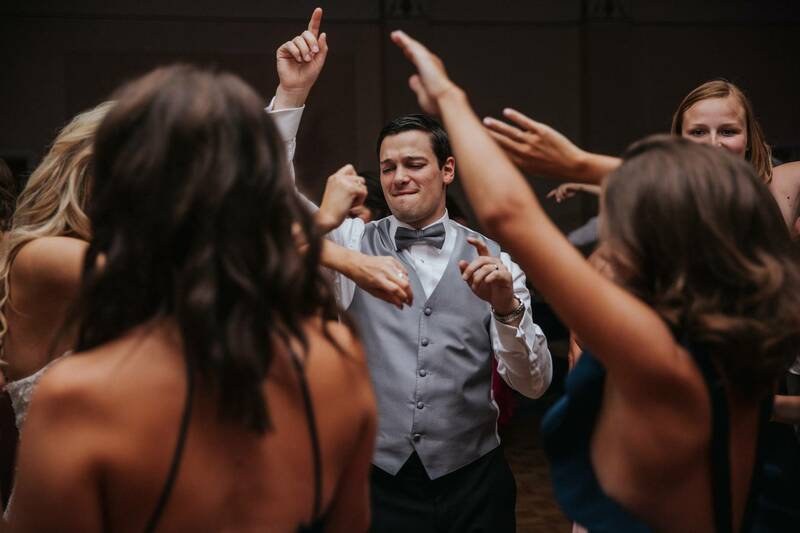 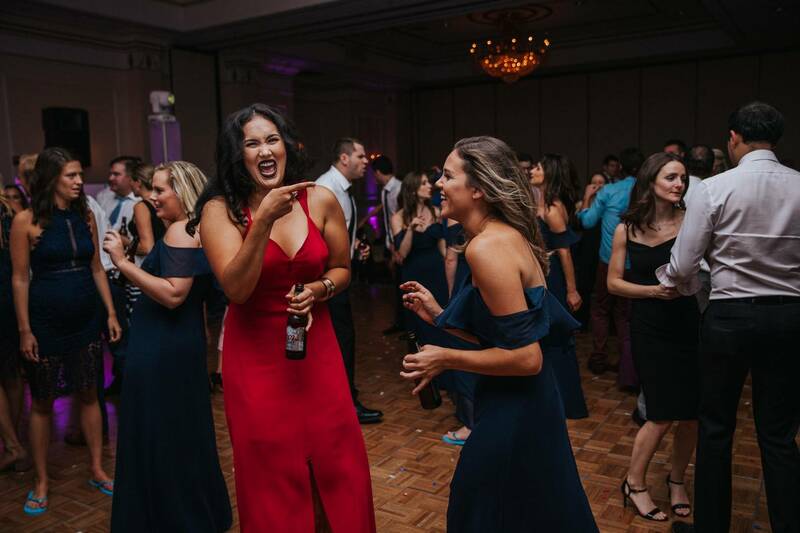 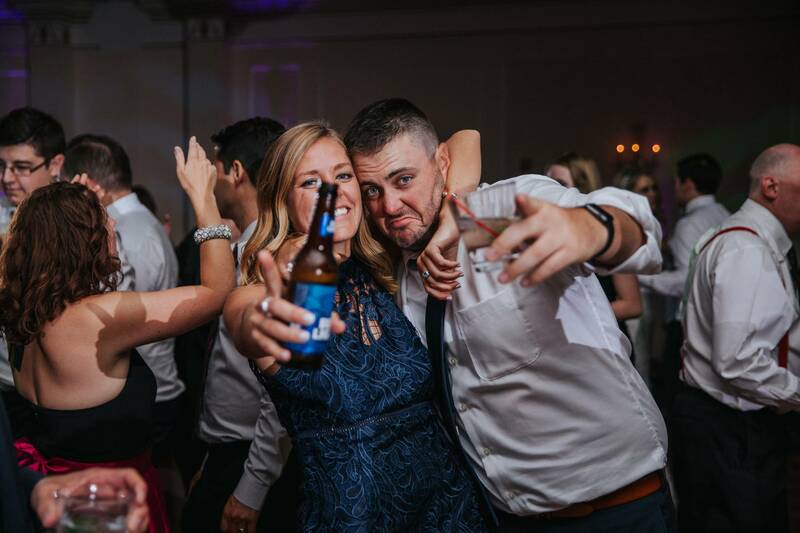 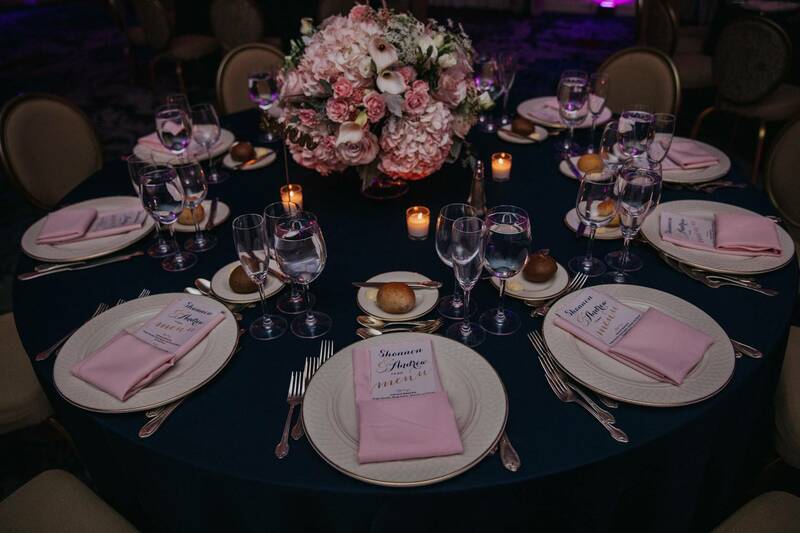 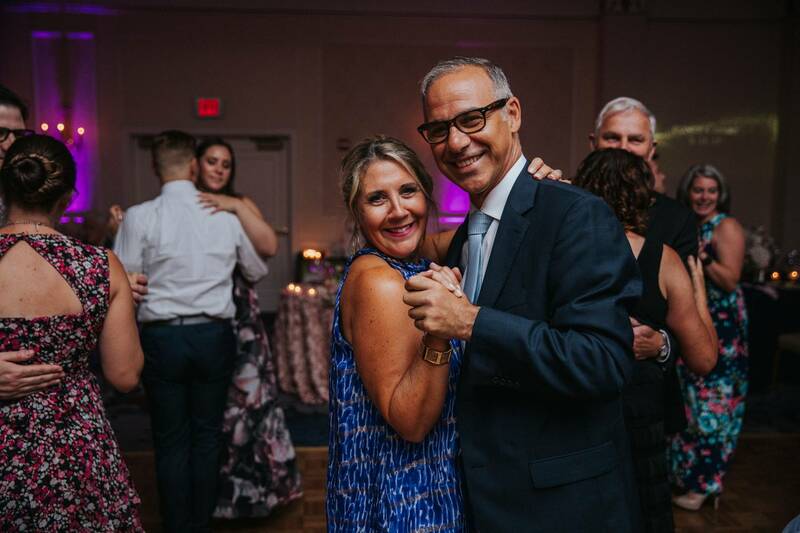 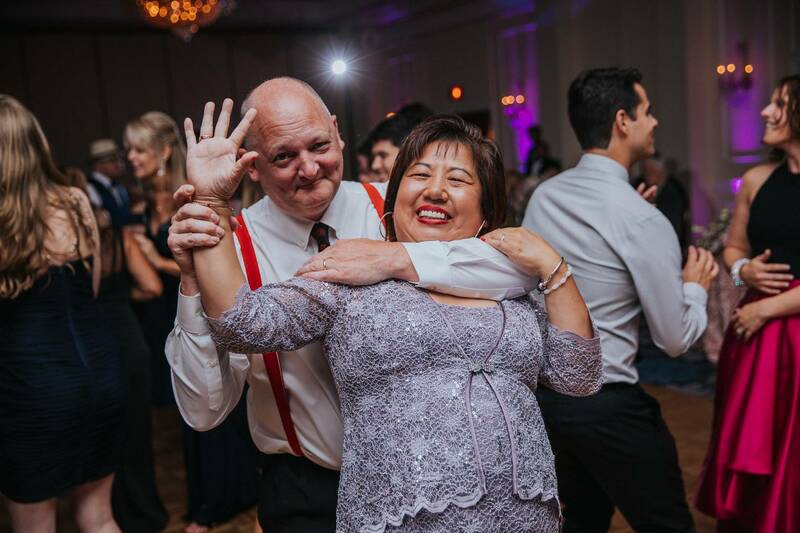 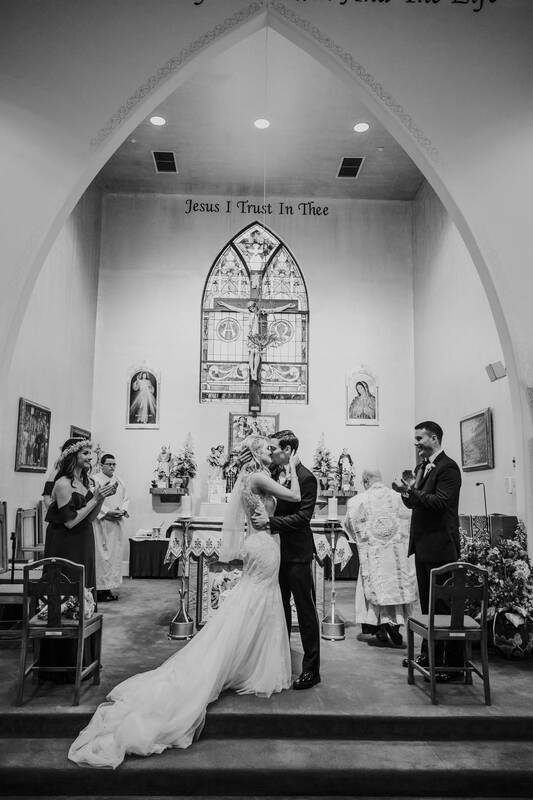 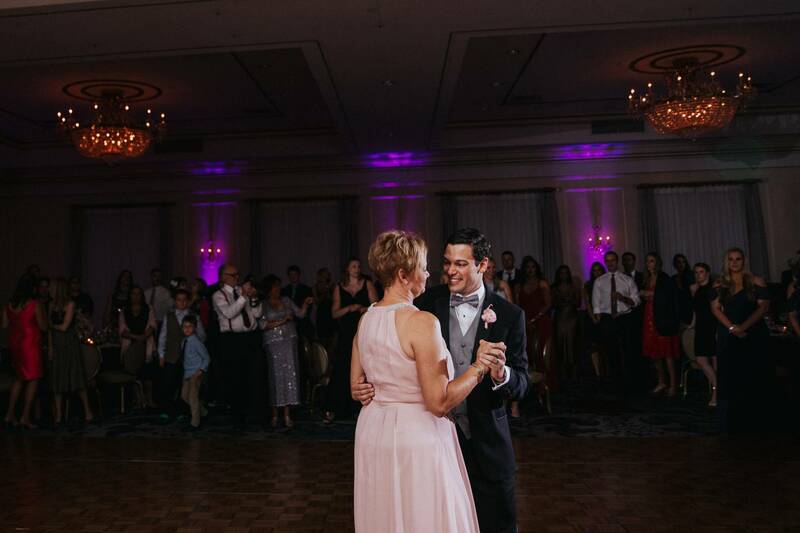 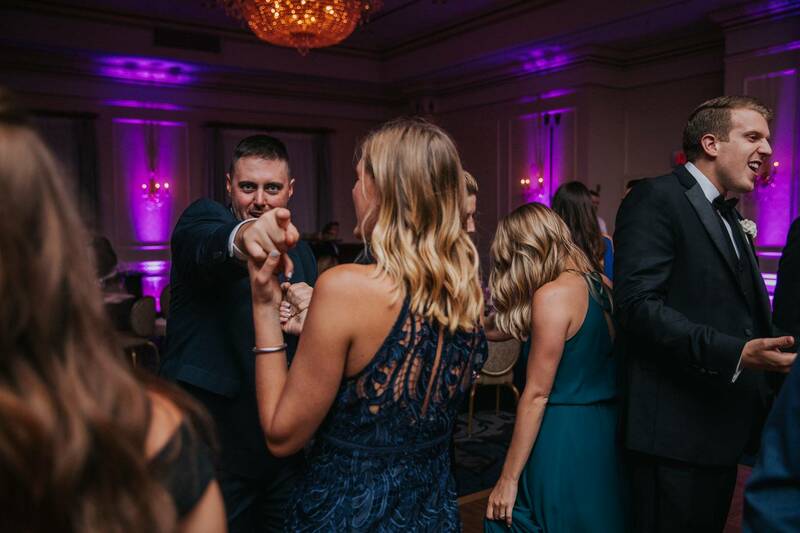 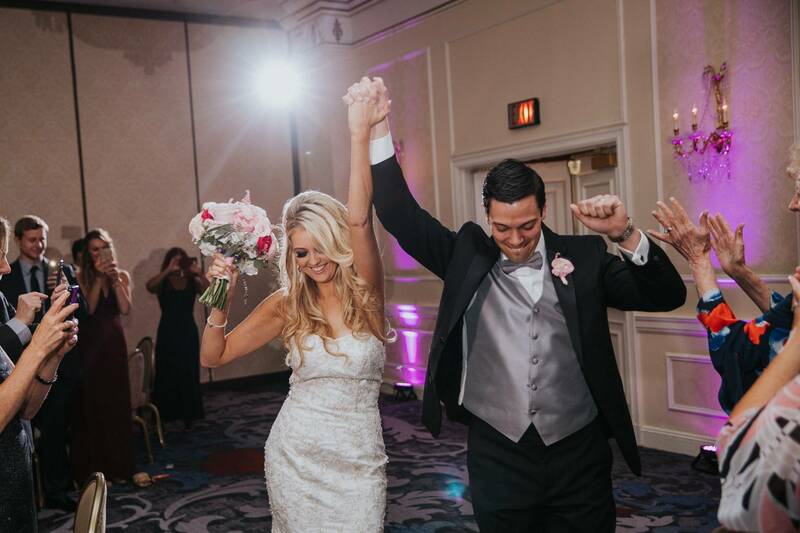 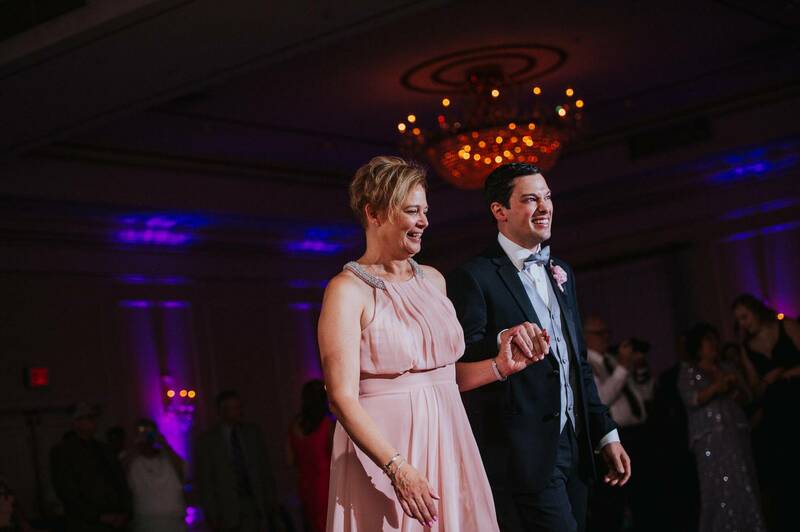 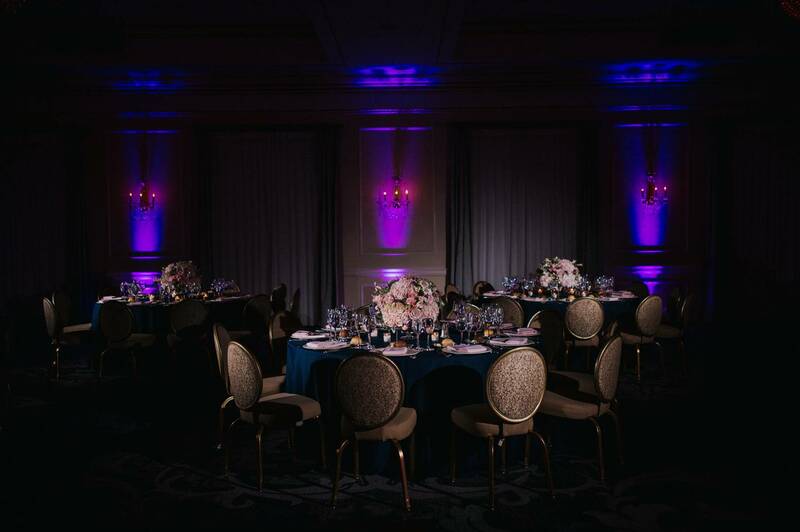 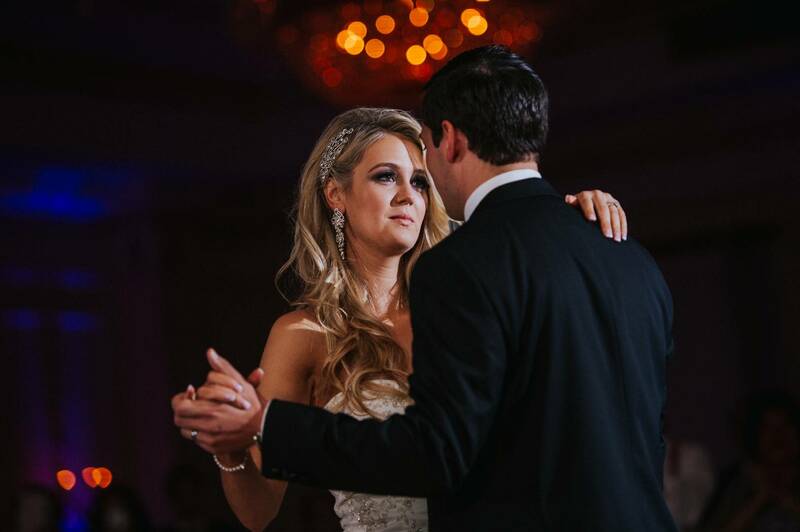 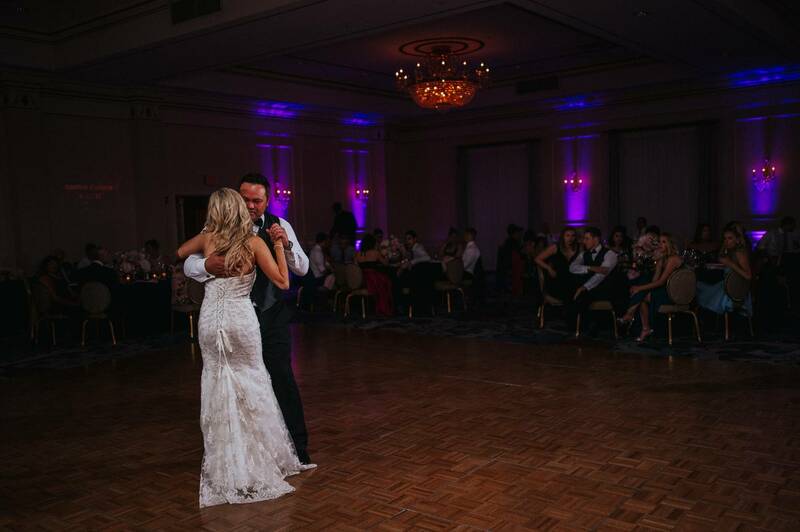 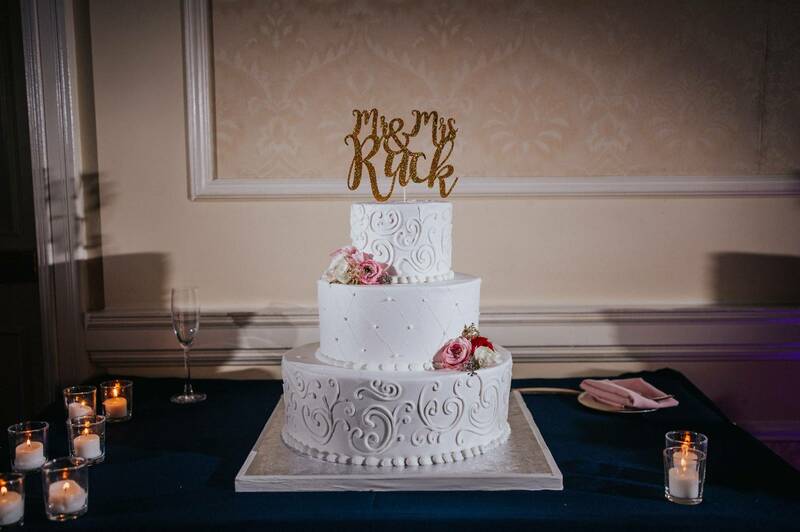 Guests took their seats full of anticipation and the reception began with high energy entrances that transitioned in a trio of touching dances between the bride, groom, and their parents. 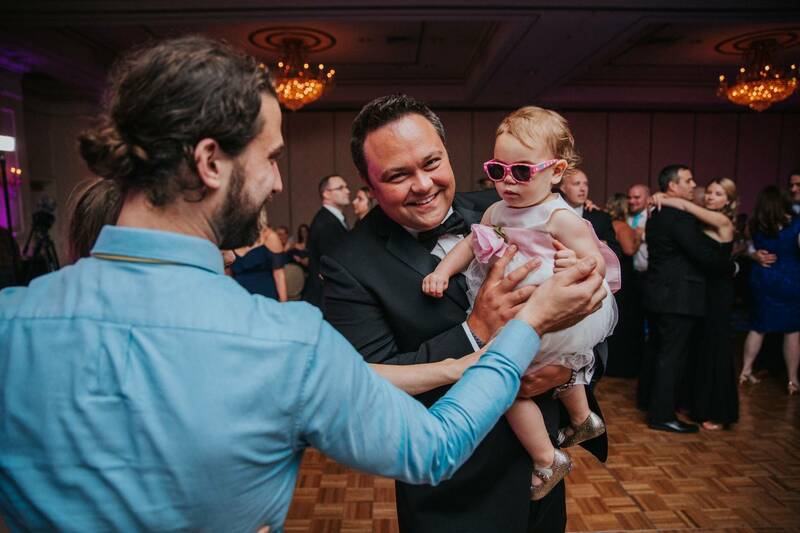 The party began even before dinner was served with the flower girl, siblings, and grandparents quickly jumping onto the dance floor. 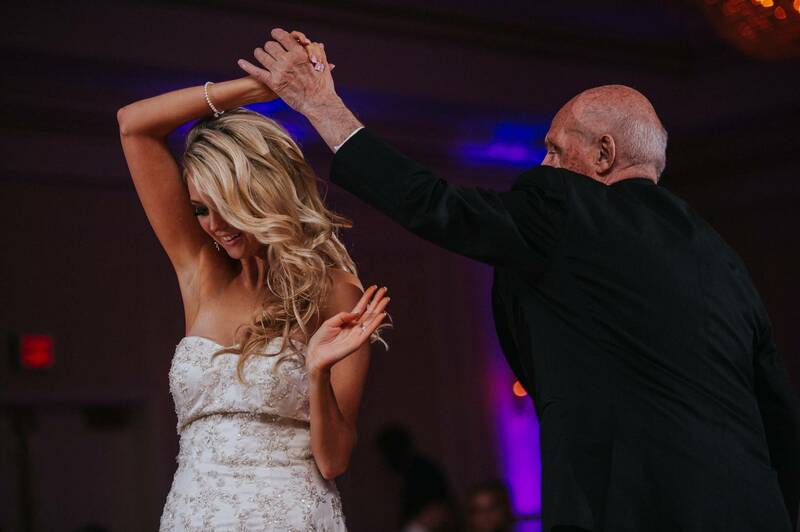 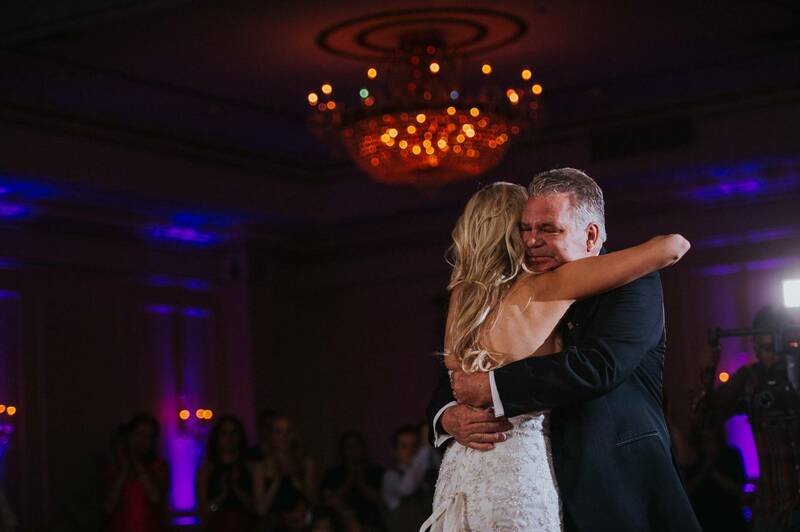 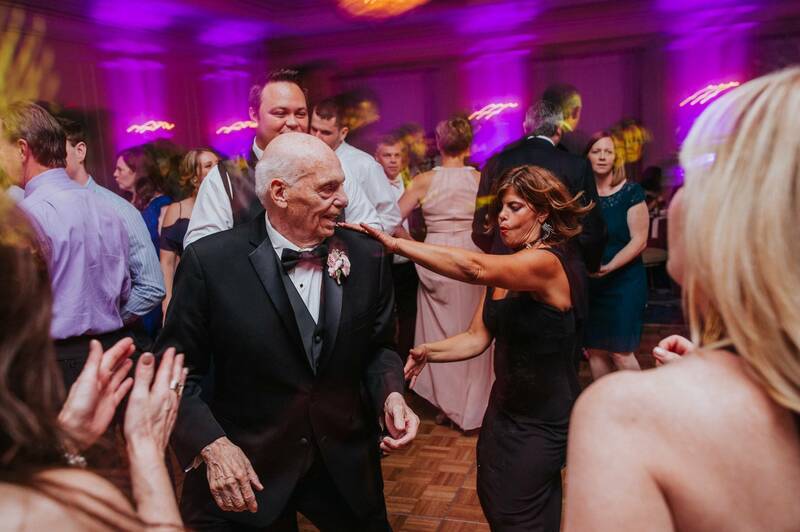 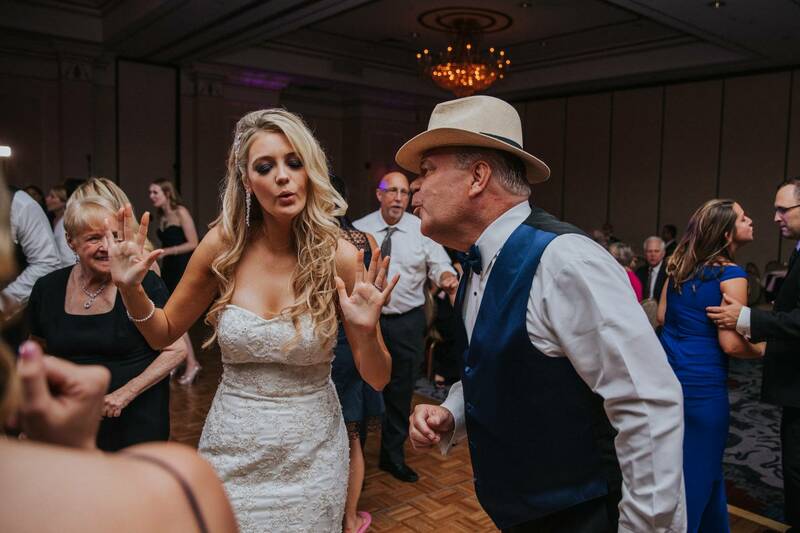 A surprise secondary set of special dances between the bride and her brother and grandfather quickly turned into the traditional family dance that left Andrew alone at the center before Shannon joined in. 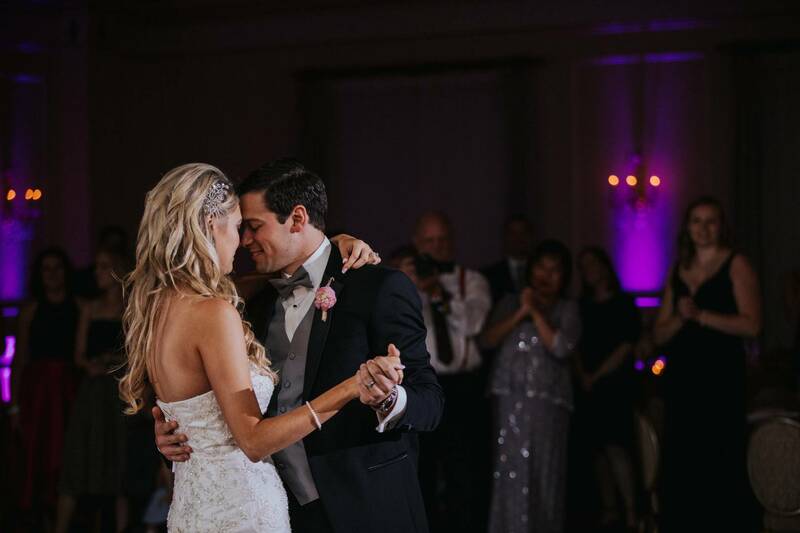 Confetti rained from the ceiling as nearly everyone in the room joined the dance floor. 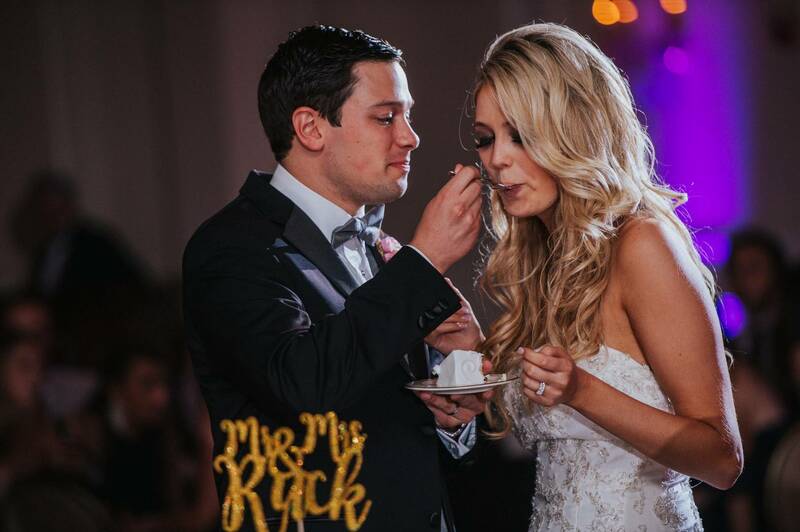 The cake was cut and desert was served as the night drew began to draw to a close. 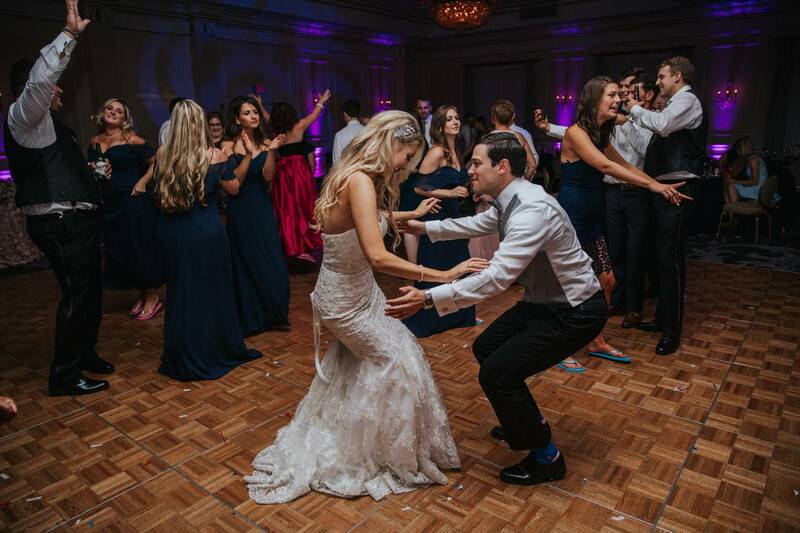 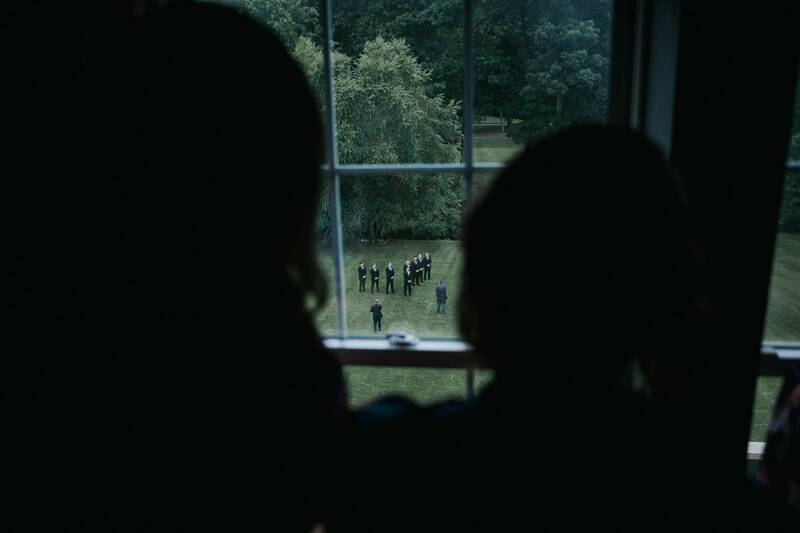 It was obvious that the new couple along with everyone else had a spectacular time from beginning to end. 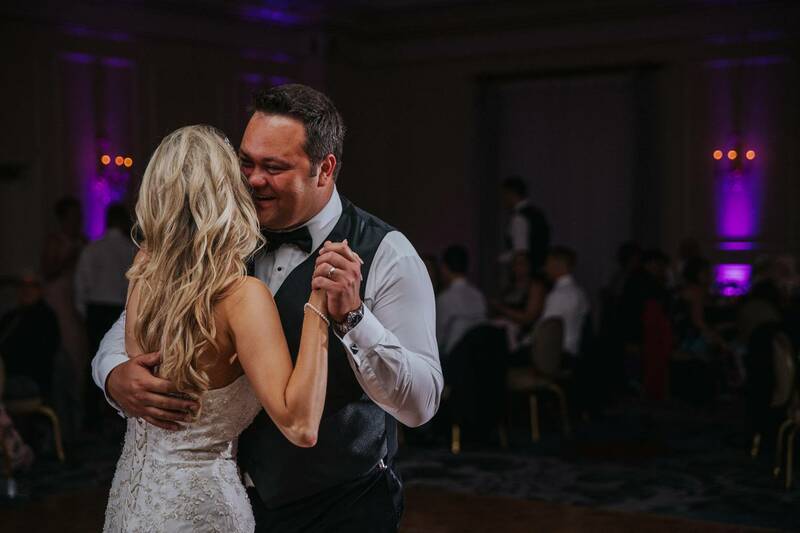 We were honored to capture their marriage and wish Andrew and Shannon the best in everything in their new lives together. 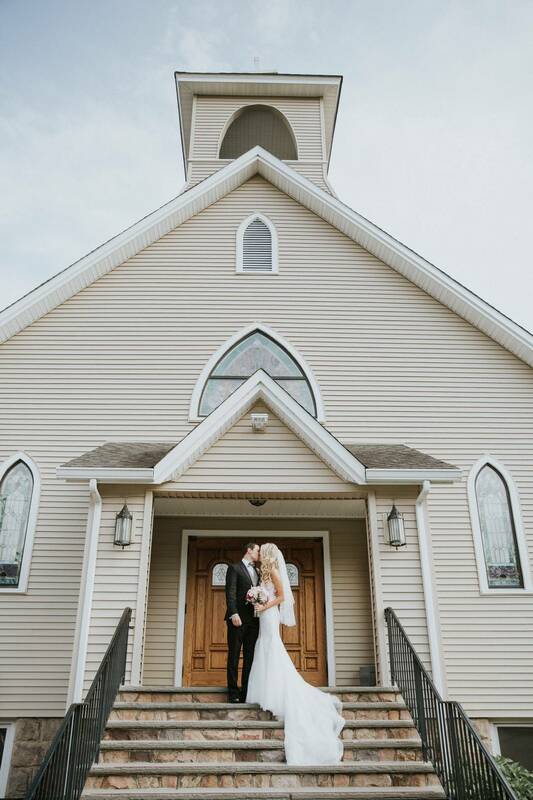 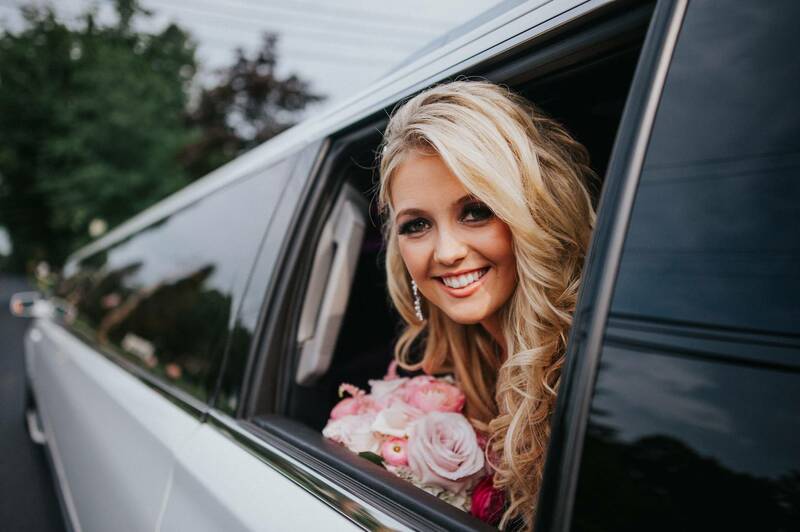 We always look forward to photographing weddings and engagements in the many unique towns in North Jersey and New York and the churches, parks, and venues among them. 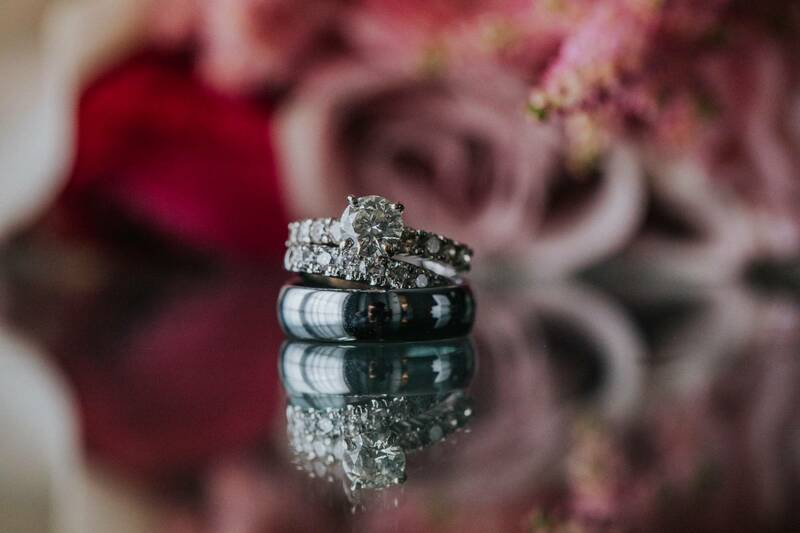 If you are looking for a wedding photographer or an engagement photographer, Contact Us for more information about or packages.